JRVisuals LLC – A sandbox for my thoughts, a penny for your two cents. The sheer number of lists and numbers that exist in the Buddhist teachings are one of the things that attracted me early on. There’s something about the logical way that things are laid out that speaks to my techy mind. And although it is through experience and feeling that we gain a true understanding of the Dharma without this logical framework of study and discussion it would be difficult to deliver or receive a lot of what leads to an understanding of these experiences. I’ve recently been working on a single-page reference sheet for some key elements of Buddhist practice and study. 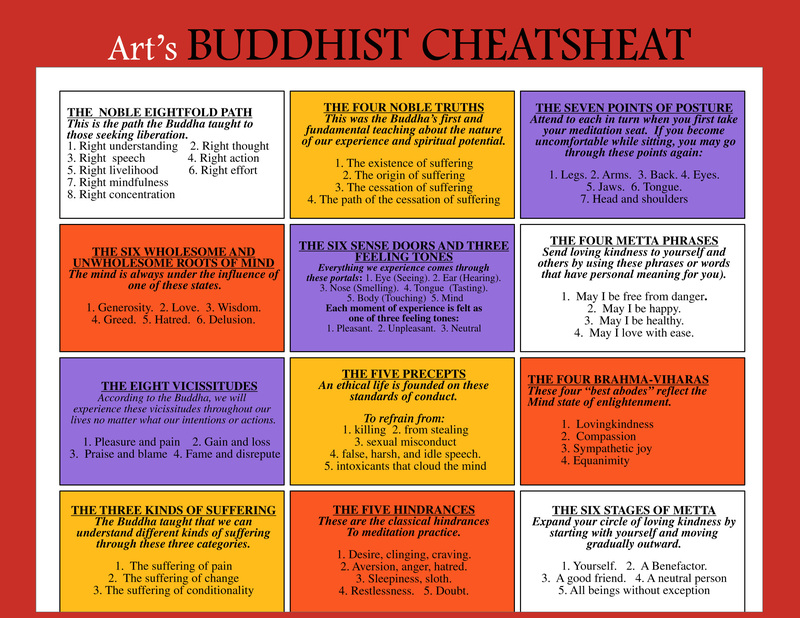 I was inspired by Art’s Buddhist Cheat Sheet by Arthur Rosengarten which was a great look-up for me several years ago. I have been using a variety of resources in this effort, starting with Mr. Rosengarten’s original infographic as a jumping off point and including the wonderful rigpawiki.org and wikipedia as well as “The Heart of the Buddha” by Chögyam Trungpa as well as my own experience of the Shambhala Training curriculum. Below is a link to an Adobe InDesign hosted version of the file which can be printed, downloaded as a PDF or shared online. I welcome your comments and feedback. Please feel free to download, share, and distribute as you see fit but note that this is just one man’s view on a sliver of what is the Shambhala Buddhist path of practice and study and not meant to be any sort of exhaustive resource or doctrinal document. I’ve labeled this reference with a version number (v1.2 as of this post) — I plan to continue updating and potentially expanding to two sides of a single page. It just feels incomplete without things like the 12 Nidanas, the 5 Buddha Families, and so many others. Just for fun, I’ve gather a couple of classic and modern infographics and may add more to this post as I find them. Samsara / The Wheel of Life Tibetan. Traditional Tibetan thangka painting. Source unknown. Attributed to Jayarava – Lot’s of neat stuff in his texts directory.